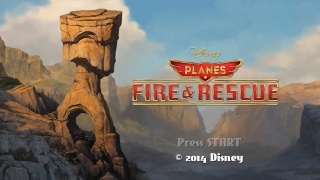 Developed and published by Little Orbit Disney Planes: Fire And Rescue is a flight oriented game where you must save citizens from fires and other accidents and disasters among other more mundane activities. The question is does this game live up to its predecessor which garnered a decent amount of positive feedback from critics and players alike or is it a disaster waiting to crash and burn? Continue reading our review to find out the answer to this question! The game starts you off with some rookie training courses to let you get the hang of fighting fires and rescuing civilians, but as a whole this isn't really necessary as the game's difficulty is painfully easy and the various missions quickly become repetitive. The stages eventually feel like more of the same, which isn't a good thing. As for the controls they are straightforward and easy to learn. The lack of Off-TV Play is rather disappointing and the game doesn't really do anything special with the Wii U Gamepad which seems like a missed opportunity and really should have been implemented in this game. The graphics of Disney Planes: Fire And Rescue are extremely disappointing as the game is definitely low resolution and even looks like a PS2 game which makes this game feel more like it should've been a budget digital title rather than a full retail title. The music and sound effects on the other hand are pretty good, but overall it doesn't make up for the game's other shortcomings. 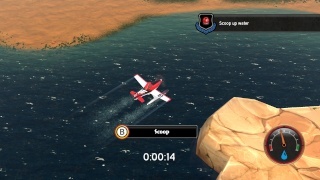 With repetitive gameplay that is far too easy even for younger gamers, dreadful visual presentation, and lack of Off-TV Play Disney Planes: Fire And Rescue is a mediocre game that we just can't recommend paying $40 for, however decent music and solid controls prevent this game from being labelled as shovelware. Regardless we give Disney Planes: Fire And Rescue a neutral recommendation. This review is now live! Enjoy. More like Disney Planes: Crash And Burn. Too bad, cuz the first Disney Planes game was kinda fun. I'm not surprised in the least that this game is mediocre lol. Games like this are why third parties struggle on Nintendo consoles.